When the Greene County Board of Supervisors placed on their agenda “Matters from the public” for their February 13th meeting, they may not of anticipated the significant turnout. The Greene citizens responded with an overflow crowd at the County Administration building including two local television stations. In this era of disrupting meetings, Greene citizens are to be commended as how they addressed the Supervisors – at the beginning of the meeting. The main issue brought up by over 20 speakers was concern about spending funds for a new E911 system when major expenditures for a dam and school expansion have been committed. The general understanding of those in attendance was that the E911 center was going to be moved at a significant cost and the former administrator was retained by the county and works in the County Administration building. Representatives of the volunteer rescue squad and Fire Departments also addressed the Board of Supervisors. Their message was clear – we are getting “no clear supervision” and it goes back and forth who we are to answer to. Several other citizens asked that the Supervisors have the courage to back up and revert to how E911 worked since 2012 and then have a committee analyze how best to address E911 services in the future. One of the final public comments was there seems to be “a failure to communicate” in Greene County – just like Paul Newman in the movie Cool Hand Luke. After the public comment – Chairperson Michelle Flynn restated what was in the press release from the Board, no decision has been made to move the E911 center. And that the intent of tonight’s public comments is to gather information to provide a safe E911 program for the citizens of Greene County. Vice Chairperson, Bill Martin, said that since he was Chairperson 18 months ago when the E911 system became an issue, he wanted to recap what has transpired. He began stressing that there is no “plot” and no decision has been made. The Board has two concerns related to E911 – safety of the citizens of Greene and providing a cost effective solution. In 2012, the E911 system was consolidated with the Sheriff’s office to be cost effective. In August, 2016, Sheriff Steve Smith “terminated” the E911 Supervisor. However, this person is employed by Greene County, not the Sheriff and therefore she could not be terminated by the Sheriff. But, she was refused admittance to the E911 center (within the Sheriff’s office) even though she was never fired by the county. The Sheriff effectively prevented her from doing the core functions of her job. Supervisor Martin continued, stating that there were no negative comments in her personnel file. She was provided office space in the County Administration building and fulfilled the rest of the duties assigned to her. Sheriff Smith then requested $77,000 additional funding to the budget to fund the hiring of a replacement. This request was denied by the Board. Smith then filed a lawsuit against the county. In October, a judge ruled in favor of the county. “That case is still pending even though the county says otherwise,” Smith stated last Friday. The county’s news release issued that week, however, stated: “On December 19, the County Administrator, with the full support of the Board of Supervisors, sent a memo again clarifying that the county-owned E911 center is under the management and direction of the county Emergency Services Coordinator. The notification did not suggest a separation or relocation of any E911 dispatch services and, in fact, the Board maintains that it changed nothing about the structure. 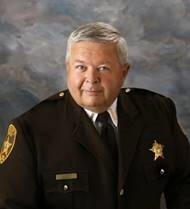 “The Sheriff continues to maintain the fully trained and qualified Emergency Services Coordinator will not be permitted in the county E911 dispatch center to provide management supervision,” the county stated. “He also asserts that the Sheriff must have full authority to determine who enters and is employed in the county-owned dispatch center because it is located in the same building the county provides for the Sheriff’s department…. Martin requested that we get all of the stakeholders at the table and find a solution that provides a safe county at no additional cost. In the end, it was agreed that a meeting with all the stakeholders, including Flynn, Board liaison Supervisor David Cox, Smith, the three fire chiefs in the county and the rescue squad be held. Sheriff Smith stated that his lawsuit would be dropped if an agreement could be reached. 4) If an agreement cannot be reached, either: the employee should be reassigned to other duties outside of the Sheriff’s office and a new E911 supervisor be hired or a new independent E911 center should be created outside of the Sheriff’s office. 5) The Sheriff and the fire chiefs need to discuss the several instances where the E911 response dispatched did not follow accepted procedures. Both parties must agree to a response protocol that protects citizens. 6) If such an agreement can not be reached, E911 must be removed from the Sheriff’s office and an independent E911 facility must be established outside the Sheriff’s office building. Any needed changes need to happen quickly as an effective and efficient E911 system is critical the the health and safety of Greene County citizens.